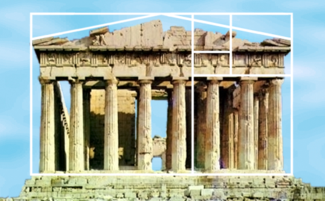 In case you haven’t heard about this before, the Golden Ratio is the concept of how to define the most aesthetically pleasing ratio between two lengths, and can be found pretty much everywhere dating back all the way to the Egyptian Pyramids of Giza. Examples abound in the world around us. Books, tables, laptops, screen sizes. Essentially anything that looks like a well-proportioned rectangle probably fits pretty closely into the Golden Ratio. You can kind of see what I mean by looking at the picture of the Parthenon at right that I found on Wikipedia. The idea is this: The length of the smaller of two distances should be related in the same way to the longer of two distances as the longer of two distances is related to the sum of the shorter plus the longer distance. Still confused? How about this: The Golden Ratio is 1.61803399. I went online a few days ago to figure out how to dimension an applet that I was making, and discovered yet another cool Google tool. Googling for “400 * golden ratio” yields the search result of 647. Very cool.